There are various 2019 Honda CR-V models to pick from, making it sometimes difficult deciding which model is right for you. We have our Honda CR-V models comparison that will break down the differences between the Honda CR-V LX and EX. Among the 2019 Honda CR-V trim levels, you’re going to find a configuration of this 5-seat crossover SUV that has the features you’re looking for while sticking to your budget. Here is a rundown of the Honda CR-V trims and their price point. Honda CR-V LX – The LX is the base trim, but that doesn’t mean you’re losing out on high-class features. Features available include a rearview camera, cruise control, Bluetooth, 5-inch LCD screen, and a USB port. Let’s not forget the 4-speaker sound system. The exterior of the CR-V LX features 14-inch alloy wheels, and LED daytime running lights. Honda CR-V EX – The CR-V EX trim includes a large 7-inch touchscreen, an upgraded rearview camera, as well as other interior features like HondaLink, satellite radio, Apple CarPlay, and Android Auto. The exterior of the EX features the addition of fog lights, heated side view mirror, and 18-inch alloy wheels. Honda CR-V LX – The CR-V LX has a powerful 2.4L four-cylinder engine that produces 184-hp and 180 lb-ft of torque. There’s also the available Honda CR-V LX AWD and FWD models. FWD comes standard with the CVT, and the CR-V LX gets up to an EPA-estimated 31 mpg highway and 27 mpg city**. Have you decided which of the 2019 Honda CR-V trims fits your needs the most? If you want to learn more about the CR-V, like the interior and exterior dimensions, we have you covered! 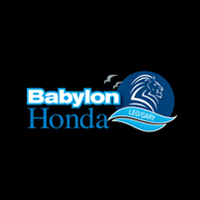 Visit Babylon Honda near Lindenhurst, and we’ll hit the road for a test drive and tell you how it compares to the Subaru Outback. Contact us today to schedule a test drive of one of our used and new in-stock Honda CR-Vs.
*MSRP excluding tax, license, registration, $1045.00 destination charge and options. Dealers set own prices. **26 city/32 highway/28 combined mpg rating for 2WD LX trims. 25 city/31 highway/27 combined mpg rating for AWD LX trims. 28 city/34 highway/30 combined mpg rating for 2WD EX, EX-L & Touring trims. 27 city/33 highway/29 combined mpg rating for AWD EX, EX-L & Touring trims. Based on 2019 EPA mileage ratings. Use for comparison purposes only. Your mileage will vary depending on how you drive and maintain your vehicle, driving conditions and other factors.